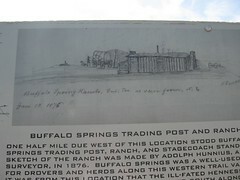 One half mile due west of the location stood Buffalo Springs Trading Post, Ranch, and Stagecoach stand. This sketch of the ranch was made by Adolph Hunnius. A surveyor, in 1876. Buffalo Springs was a well - used stop for drovers and herds along this western trail variant. 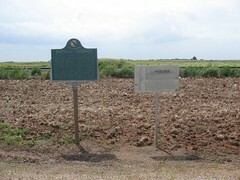 it was from this location that the ill - fated Hennessey Party departed on July 4, 1874. Headed south along the Ft. Sill - Arkansas City wagon road despite warning of Indian hostilities in the area. A few miles south, the Party was attacked and killed. On the Old Chisholm Trail, 1/3 mi. west. From this noted watering place came the name of "Bison," 1 mi. 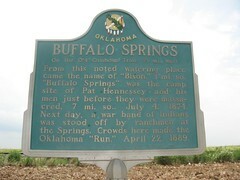 so., "Buffalo Springs" was the camp site of Pat Hennessey and his men just before the were massacred, 7 mi. so., July 4, 1874. Next day, a war band of Indians was stood off by ranchmen at the Springs. Crowds here made the Oklahoma "Run," April 22, 1889.